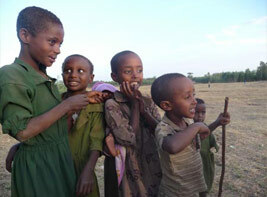 We thought it would be interesting to tell you about three of the residents in Bahir Dar. Firstly we would like to introduce Gashow. Gashow is 21 years old. As a child he had Polio and due to this has a very limited use of his left leg and requires a stick to get about. Gashow lived in the country with his parents, his mother died and his dad remarried. His dad’s new bride decided that she did not want the responsibility of bringing up a disabled boy so she threw Gashow out of the home, Gashow was about 12. He was taken in by the church that decided to send him to Bahar Dar so he could attend school. Sister Tefartu found him a place to live free of charge, as he is responsible for taking care of the house whilst the tenants are at work. Gashow only had the clothes on his back, which incidentally is his school uniform given to him by the school. Because of this we decided to get him some new clothes. We took him into town and let him choose, he picked out a pair of jeans, shirt, jumper and a sturdy pair of boots. As a treat we bought him an Arsenal (his choice) football shirt, fake shirts can be purchased on the market for £3.00. The smile on Gashow’s face got broader as the day went on and to sit and have a drink in the local juice bar was a real treat for him. On the way home we asked Sister Tefartu if there were any vacancies in the sewing project for Gashow. She said yes but would need the agreement of his landlord. His landlord said yes and now Gashow attends school in the morning and the sewing project in the afternoon. When we left he was doing very well and we hope that when we return he will be trained and able to start a little sewing business of his own with a loan from the school. You can see how he was doing when we saw him on our next visit here.